One of the most prominent leaders of modern German orthodoxy; born at Neuwied in 1808; died at Halberstadt Sept. 30, 1872. 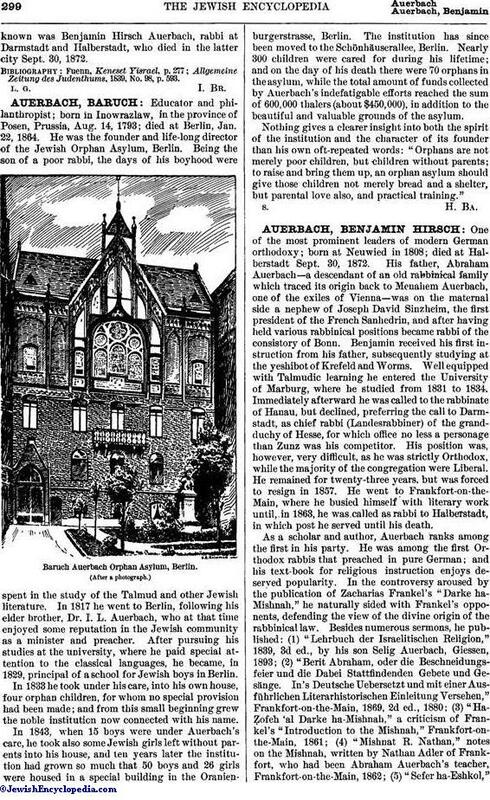 His father, Abraham Auerbach—a descendant of an old rabbinical family which traced its origin back to Menahem Auerbach, one of the exiles of Vienna—was on the maternal side a nephew of Joseph David Sinzheim, the first president of the French Sanhedrin, and after having held various rabbinical positions became rabbi of the consistory of Bonn. Benjamin received his first instruction from his father, subsequently studying at the yeshibot of Krefeld and Worms. Well equipped with Talmudic learning he entered the University of Marburg, where he studied from 1831 to 1834. Immediately afterward he was called to the rabbinate of Hanau, but declined, preferring the call to Darmstadt, as chief rabbi (Landesrabbiner) of the grandduchy of Hesse, for which office no less a personage than Zunz was his competitor. His position was, however, very difficult, as he was strictly Orthodox, while the majority of the congregation were Liberal. He remained for twenty-three years, but was forced to resign in 1857. He went to Frankfort-on-the-Main, where he busied himself with literary work until, in 1863, he was called as rabbi to Halberstadt, in which post he served until his death. As a scholar and author, Auerbach ranks among the first in his party. He was among the first Orthodox rabbis that preached in pure German; and his text-book for religious instruction enjoys deserved popularity. In the controversy aroused by the publication of Zacharias Frankel's "Darke ha-Mishnah," he naturally sided with Frankel's opponents, defending the view of the divine origin of the rabbinical law. 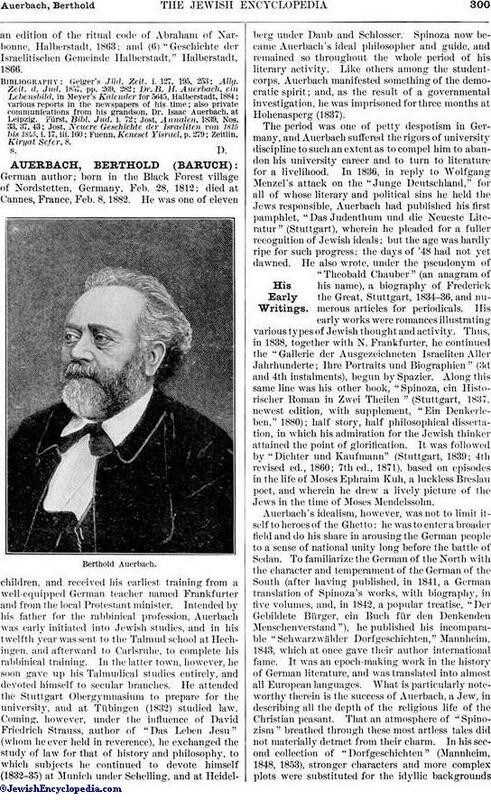 Besides numerous sermons, he published: (1) "Lehrbuch der Israelitischen Religion," 1839, 3d ed., by his son Selig Auerbach, Giessen, 1893; (2) "Berit Abraham, oder die Beschneidungsfeier und die Dabei Stattfindenden Gebete und Gesänge. In's Deutsche Uebersetzt und mit einer Ausführlichen Literarhistorischen Einleitung Versehen," Frankfort-on-the-Main, 1869, 2d ed., 1880; (3) "Ha-Ẓofeh 'al Darke ha-Mishnah," a criticism of Frankel's "Introduction to the Mishnah," Frankfort-on-the-Main, 1861; (4) "Mishnat R. Nathan," notes on the Mishnah, written by Nathan Adler of Frankfort, who had been Abraham Auerbach's teacher, Frankfort-on-the-Main, 1862; (5) "Sefer ha-Eshkol,"an edition of the ritual code of Abraham of Narbonne, Halberstadt, 1863; and (6) "Geschichte der Israelitischen Gemeinde Halberstadt," Halberstadt, 1866.